Matrimony is a beautiful sacrament whereby the union of love between a man and woman is established for their whole life. Marriage is a lifelong commitment involving freedom, consent and responsibility. As such the Catholic Church respects the need for couples in love who desire to get married to be fully informed regarding their marriage vows. 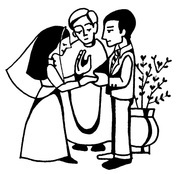 This means that all couples must attend a marriage preparation course to ensure that they understand and accept fully the Catholic Church's understanding of the sacrament of Holy Matrimony. Follow these steps to arrange your marriage. 1. Contact the Parish Office either by telephone (01527 63096) or by using the Submission Form (opposite). Select a marriage date. This date must be at least a year ahead in order to reserve the date and allow sufficient time for the necessary preparations. 2. You will be informed in writing of the next available Marriage Preparation Course. 3. Attend the compulsory Marriage Preparation Course. 4. Do not forget to register your intention to marry with the Marriage Registrar's Office. The Redditch Registration Office is 29 Easemore Road, B98 8ER. Marriages at the Parish Church Our Lady of Mount Carmel are celebrated on Fridays and Saturdays only and when there are no other events taking place.